The composition of the fiber determines the refractive index. 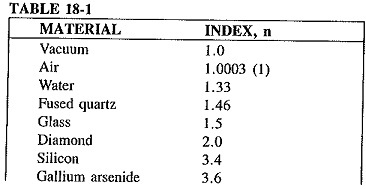 By a process called doping, other materials are introduced into the material that alter its index number. This process produces a single fiber with a core index n1 and a surface index (cladding) n2 (typically n1 = 1.48 and n2 = 1.46). The step index describes an abrupt index change (see Table 18-1) from the core to the cladding, for example, a core with a uniform index (1.48) and a cladding with a uniform index (1.46). With graded-index fiber, the highest index is at the center (1.48). This number decreases gradually until it reaches the index number of the cladding (1.46), that is, near the surface. The multimode step-index fiber has a core diameter of from 100 to 970 jam. With this large core diameter, there are many paths through which light can travel (multimode). Therefore, the light ray traveling the straight path through the center reaches the end before the other rays, which follow a zigzag path. The difference in the length of time it takes the various light rays to exit the fiber is called modal dispersion. This is a form of a signal distortion which limits the bandwidth of the fiber. The multimode graded-index fiber is an improvement on the multimode step-index fiber. Because light rays travel faster through the lower index of refraction, the light at the fiber core travels more slowly than the light nearer the surface. Therefore, both light rays arrive at the exit point at almost the same time, thus reducing modal dispersion (an example of these losses can be seen in Figure 18-17). 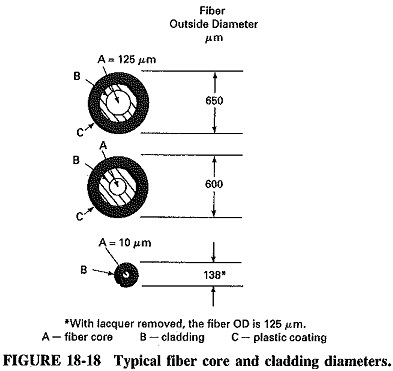 A typical graded-index fiber has core diameters ranging from 50 to 85 μm and a cladding diameter of 125 μm. The bandwidth is from 50 to 100 GHz/km. The digital communications rate is in excess of 2000 Mbyte/s. More than 100,000 voice channels are available. 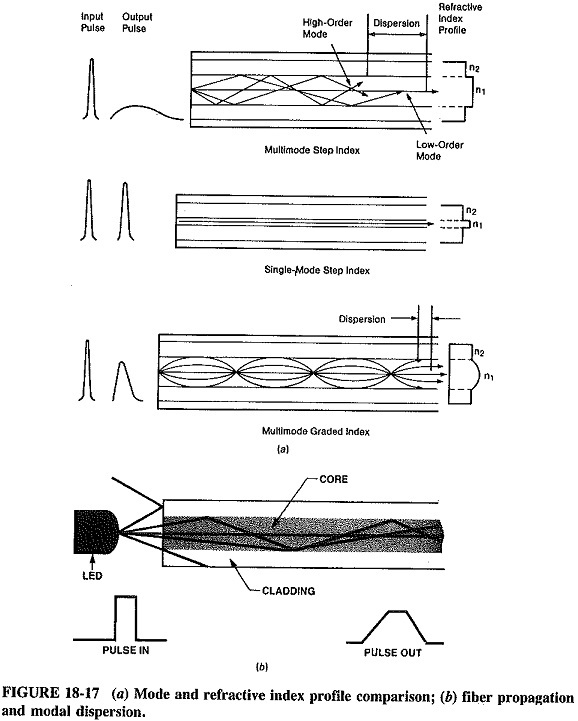 Light wavelengths approach core diameter; therefore, higher frequency capabilities are achieved. The mode field diameter (MFD; spot size) is larger than the core diameter. From Equation (18-7) we can develop another relationship which also describes the maximum light propagation angle; it is commonly called the cone of acceptance (see Figure 18-19). In general, Optical Fiber Classification with high bandwidths have low NA and thus fewer modes and less modal dispersion. NAs range from 0.50 for plastic to 0.21 for graded-index fibers.